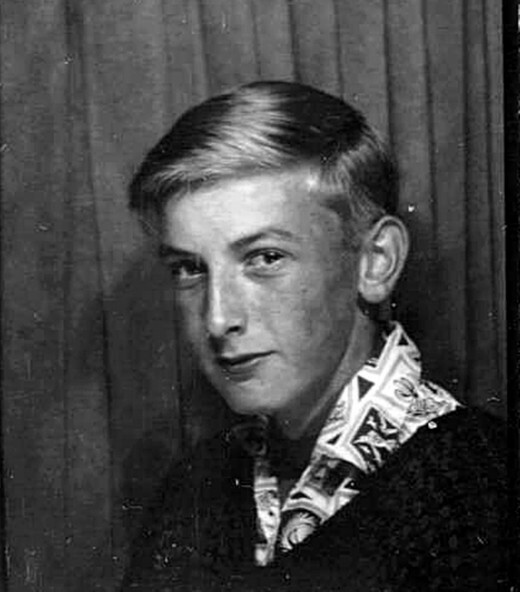 My big brother, Eric, in his teens. Finding old family photos can bring back so many happy memories! I found myself on a huge nostalgia trip recently, when I was looking through my mum's old photo albums, recalling what great fun we had when I was a kid. I was lucky enough to have a big brother, who didn't seem to mind that I was a complete little pain! 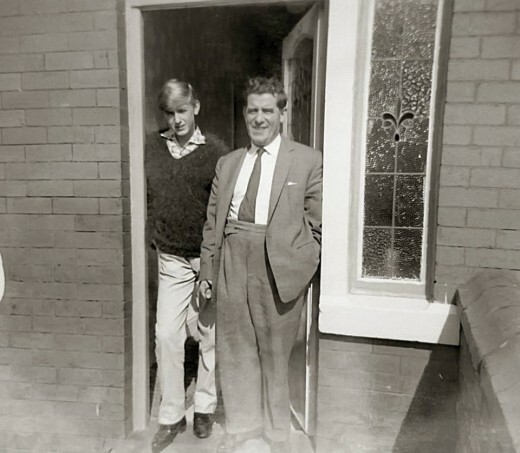 Even though Eric was nearly 15 when I was born - at an age when many youths wouldn't be thrilled with a new baby in the house - my brother always looked after me. I have to say, it couldn't have been easy - looking back, I don't think I was the easiest child to deal with! I was nervous, clingy, shy, highly strung, animal-mad and prone to having an over-active imagination. But I'm so lucky because my brother has always looked out for me and our good relationship has continued throughout our life. I still look to him today for advice and guidance. 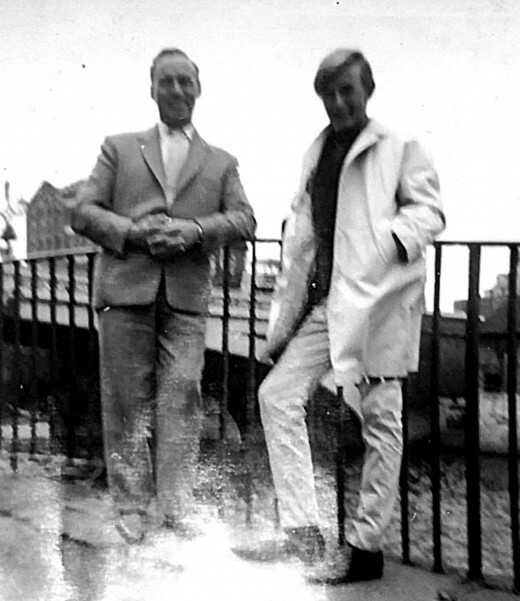 My brother in the 1960s, pictured with our dad on a day out. Looking back, I reckon my brother looked pretty cool! Zooming round the house at six months old! 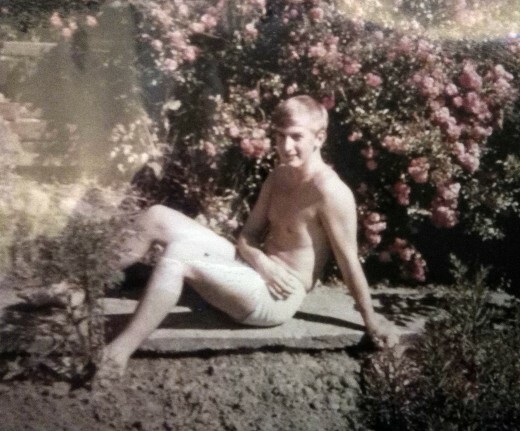 My brother was pretty cool in his youth - almost 6ft tall, with blond hair and wearing the skinny jeans that were the fashion of the day, he cut an imposing figure in the first photograph I remember being taken. Of course, at the time, I didn't realise what a dude Eric was ... to me, he was just my big brother! But looking back, I think he looks pretty good. 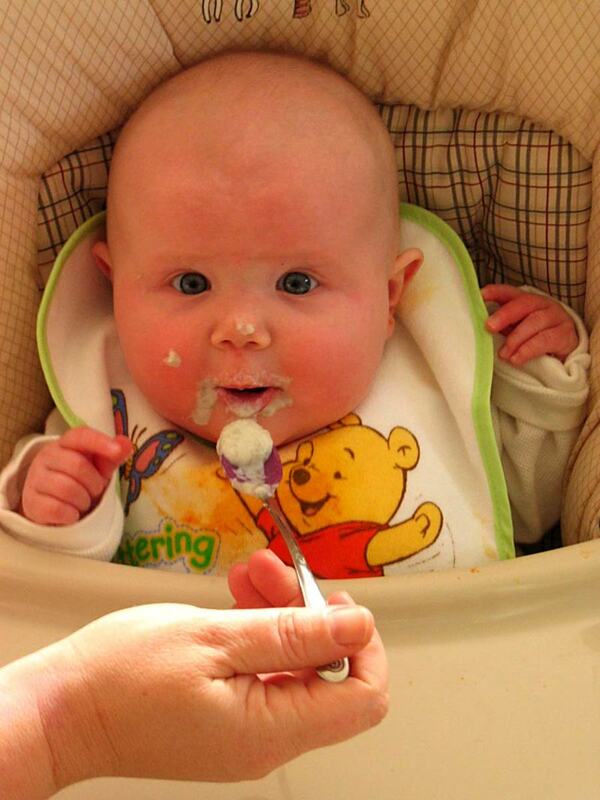 I was only about six months old (I don't know if it's unusual to remember anything from such a young age!) but I recall a feeling, more than a memory, of looking for my brother and pelting down the hall as fast as I could, until I saw his familiar figure ahead of me. 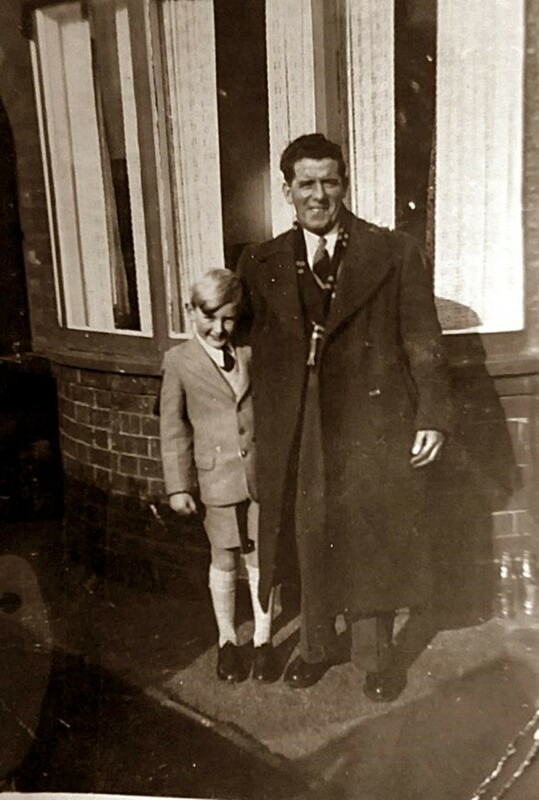 Hence our photograph in the front doorway of our old house was taken, with my little hand holding on to Eric's foot! 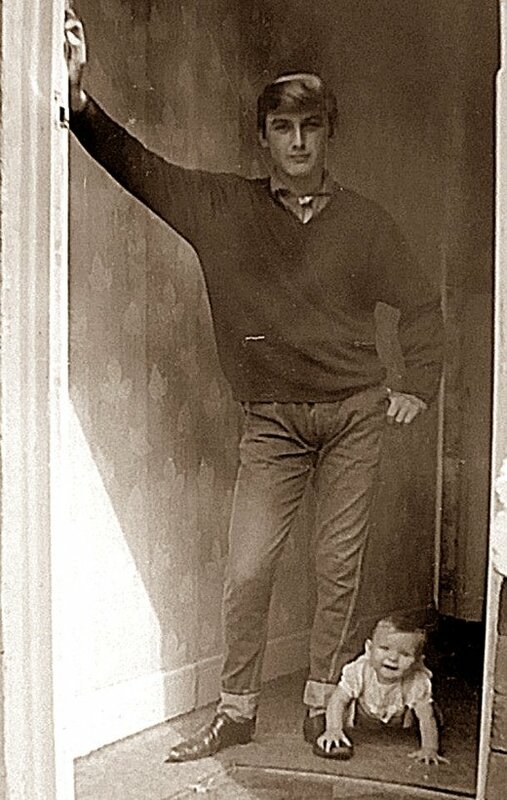 Mum said, years later, when we were looking at old photos together, that the whole family had been in the dining room when dad had decided to start taking photos, suggesting one of Eric in the doorway. 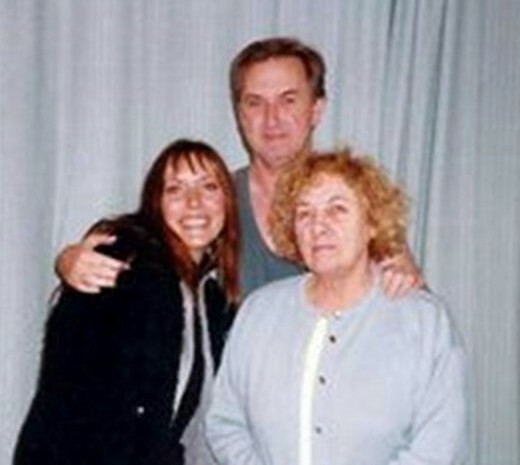 I had been in a chair, dozing, so they left me for a couple of minutes and went down the hall to take the picture. Next minute, I had appeared crawling round the corner, a look of grim determination on my little face, till I found them again and I had to be in on the photograph! My earliest memory: My big brother posing for a photograph, which I gatecrashed after crawling speedily down the hall. We were very lucky to be brought up in the seaside resort of Blackpool, on the north west coast of Lancashire. 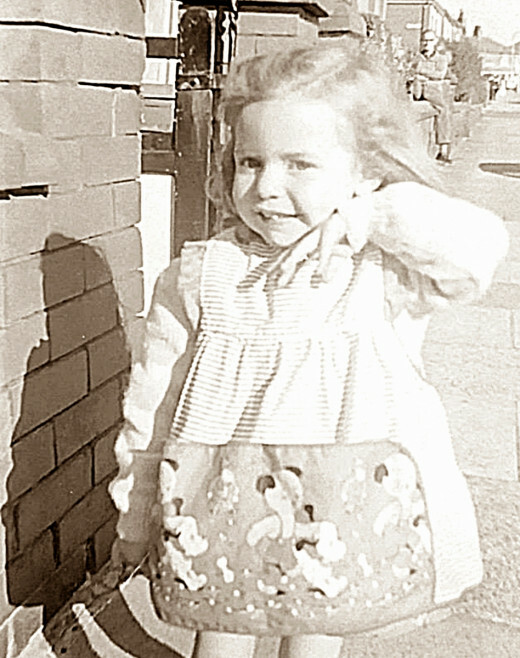 There was always plenty to do - days on the beach, funfairs, the zoo, Ripley's Odditorium, Tussaud's Waxworks, Stanley Park, or just simple pleasures, such as going for a cycle ride, or playing on my swing, see-saw and slide in our back garden. We couldn't have asked for a better childhood. We always found plenty to do for entertainment - in my brother's case, he taught himself to play the acoustic guitar and was very talented. He played all the hit songs of the day. For many years, I had an old reel-to-reel tape recording of him playing and singing Tommy Tucker's "High Heel Sneakers" - and if the show had been around today, I think he could have successfully been on The X Factor! Sadly, the reel-to-reel tape recorder was lost when we moved house - something I have often regretted. I remember dad took piano lessons a few years later, but although he persevered, he did not have a natural gift, unfortunately. Meanwhile, I went to dance lessons and took part in various children's theatre productions, my favourite routine being Teddy Bears' Picnic. However, stage fright got the better of me and my childhood theatrical career was mercifully quite short-lived. Perhaps we should have started a family band ... or perhaps not! I don't think we would have rivaled The Osmonds when it was only my brother who had any real, natural talent! Today, my niece - my brother's teenage daughter - has also taught herself to play acoustic guitar and sing and she's very good. She has videos posted on YouTube. In my brother's youth, we didn't have this social media platform to display our talents and his performances were just at home to entertain the family. 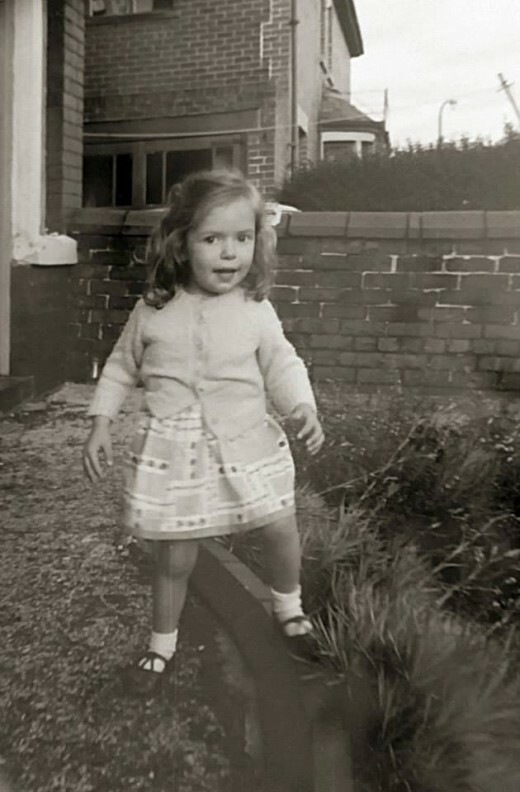 This was me, posing, aged about 18 months, in the street outside grandma's guesthouse. If you look closely, you will see my brother sitting on a wall in the background, keeping an eye on me. Wherever he went, I wasn't far behind. I was the person no-one wanted on the relay team! My brother was multi-talented in his youth and as well as being very intelligent and attending the local private school, he was also sporty, playing cricket and rugby. Unfortunately, I did not share his sporting prowess and was useless at school - the kid whom nobody wanted on the relay team and for whom the annual sports day was one of fear and horror! I recall being the only person left on the running track at the end of the relay - a lone figure because I was a good four or five minutes behind everyone else as I plodded home! I received a sympathetic round of applause as I reached the finishing line and wanted to crawl into a hole and vanish. I recall the whole family one night trying to teach me how to do a forward roll, as my junior school was putting us through the British Gymnastics' BAGA awards. We had to pass only four disciplines of a possible 12 to gain the lowest grade four award. Sadly, after an evening of the whole family, including mum and dad, demonstrating forward rolls on a mattress in the lounge, I still hadn't mastered it and on the day of my BAGA exam, I failed miserably, turning mine into something resembling a headstand and falling off the gym mat sideways, to the great hilarity of my classmates! 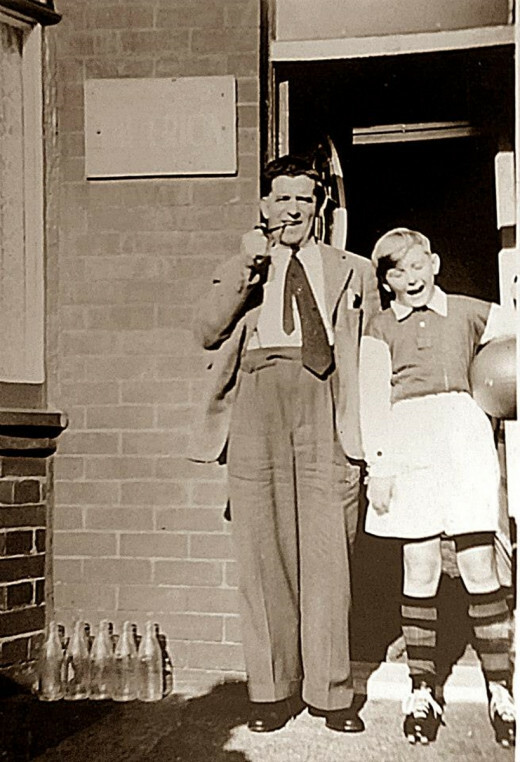 Pictured with our grandad outside grandma's bed and breakfast guesthouse, my brother is wearing his rugby gear. 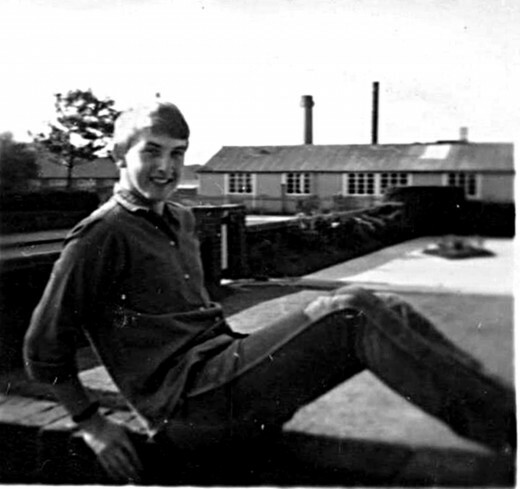 Another vivid memory was of my brother joining the Army cadets through school and his smart uniform and shiny boots, which he polished until you could see your face in them. Mum and dad always went down to the Remembrance Sunday parade and service at the Cenotaph on Blackpool seafront and would look out with pride for my brother as he marched past with the cadets. Mum would be poking my shoulder as I stood in front of her, saying, "Look, look, there's your brother!" I always expected him to wave to me as he walked past - of course, he couldn't, as he was on military parade! 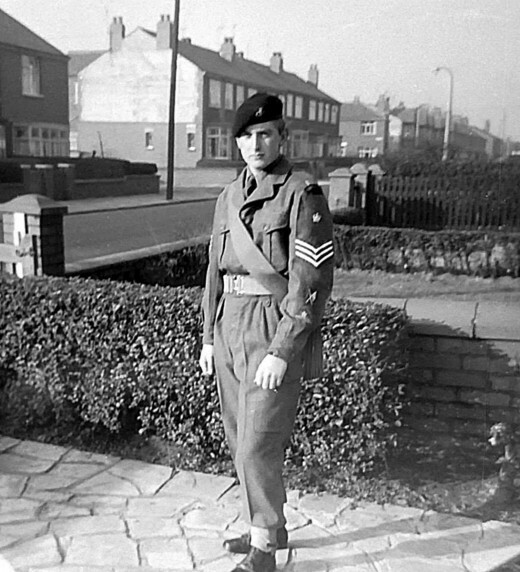 My brother in his Army uniform, standing in the front garden of the house where we grew up. He drove like greased lightning! 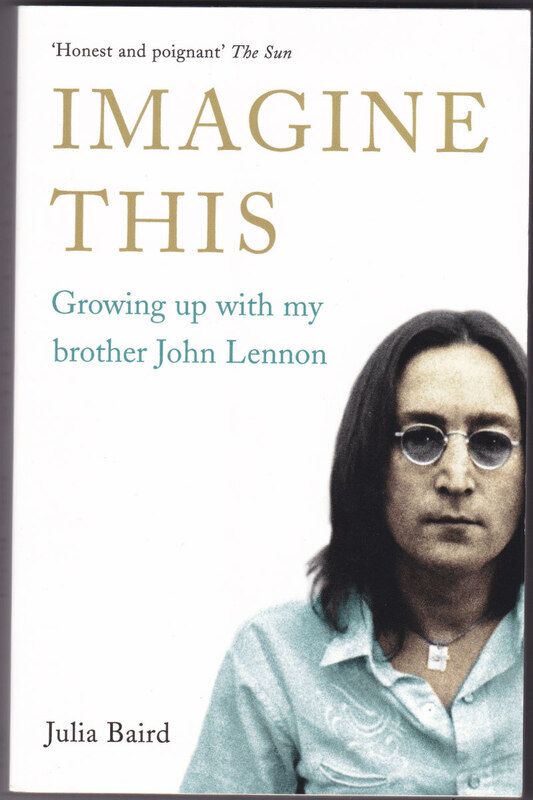 The other thing I will always remember about my brother is the fact that as soon as he was old enough, he bought himself a string of wonderful two-door sports cars and I was the envy of my friends as I was driven round in the latest motors of the day. 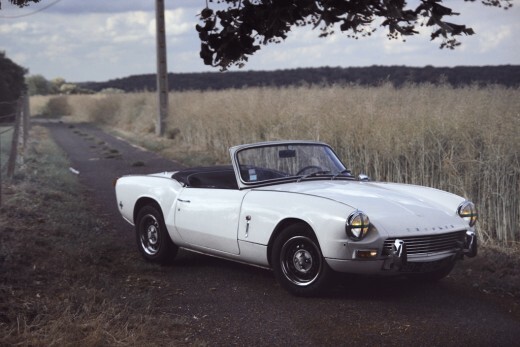 One I particularly remember was his Triumph Spitfire, a sports car which went like greased lightning on the motorway. 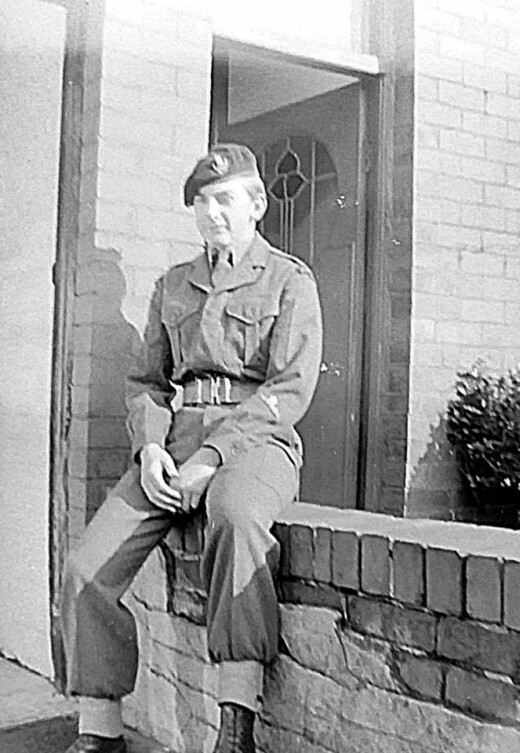 We had relatives in Bolton, Lancashire, whom we visited quite frequently - my mum's cousin Shirley and her family. It was a 40-mile drive to visit them from our home in Blackpool and we would go over a few times a year, usually in summer. My brother gave our grandma and me a lift there one particular weekend. 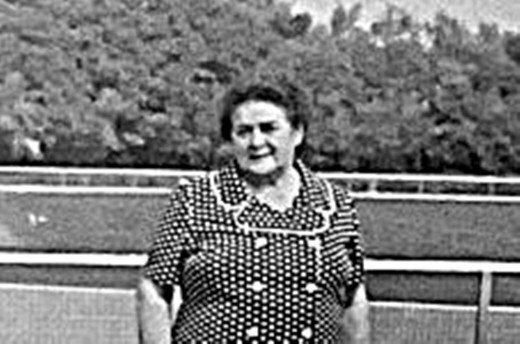 I remember grandma, who wasn't a confident passenger, putting her hands over her eyes the whole journey down the M61 motorway as we sped past heavy goods vehicles and other traffic in the fast lane. My brother wasn't a dangerous driver - just fast and nipping in and out of traffic jams in his little sports car - but grandma was a nervous wreck (ironically rather like our mum is when either of us take her out in the car today) and squealed, "Oh, Eric, be careful!" the whole journey. 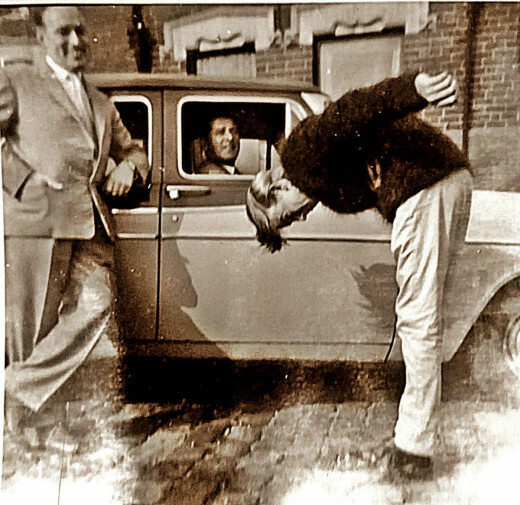 My brother in his youth, fooling around outside our house, with our dad on the left and grandad in his car. Eric fooling about with our grandma, who wasn't a big fan of riding in a two-seater sports car! 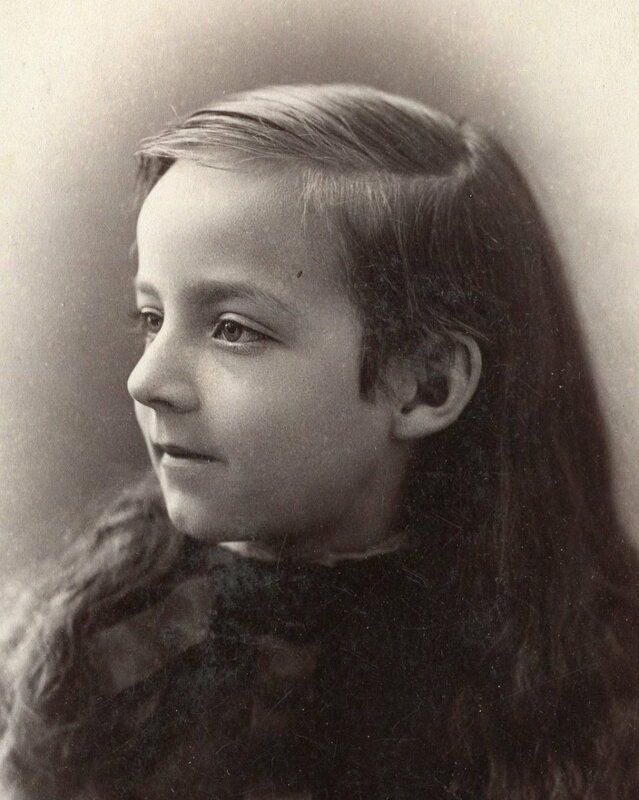 Me when I was little - like grandma, I wasn't cut out for life in the fast lane! 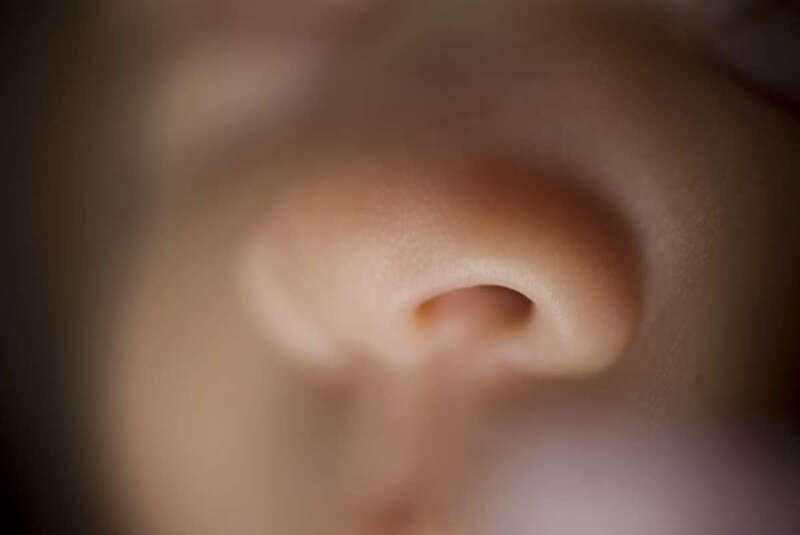 I suffered from travel sickness and I recall sitting in the little "bucket seat" behind the driver, so close to the ground that I felt every motion of the car, feeling increasingly sick. I think my brother was determined to beat dad home, as mum and dad were in the "sensible" family saloon car - the trusty Morris Marina - and dad never drove that fast. We certainly did beat them back - by a good half hour - and by the time mum and dad got home, grandma was already sitting in her armchair having a cup of tea and recovering from her ordeal! I had staggered out of the back seat, my legs like jelly and feeling very nauseous. It took me all day to recover! 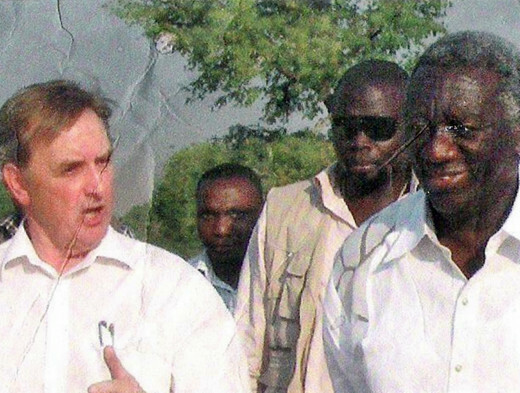 My brother Eric, on the left, with clients on one of his civil engineering contracts overseas. Civil engineering took Eric all over the world! As time passed, my brother, who had attended university, passed all his examinations to become a Member of the Institute of Civil Engineers. As our grandma took great delight in telling people, he now had letters after his name, which she remembered easily because it was MICE. He joined the county council, where he was responsible for building parts of Lancashire's motorway network, after which he worked on many important highways-building projects, both here in the UK and overseas. When he was first working abroad, before the days of internet, email and mobile phones, I recall he bought our mum a fax machine so we could keep in instant contact. I recall mum would write 20-page letters, all hand-written, which I would help her fax to my brother, wherever he was in the world. It would take such a long time to fax across and I remember thinking it must have used so much paper at my brother's home! 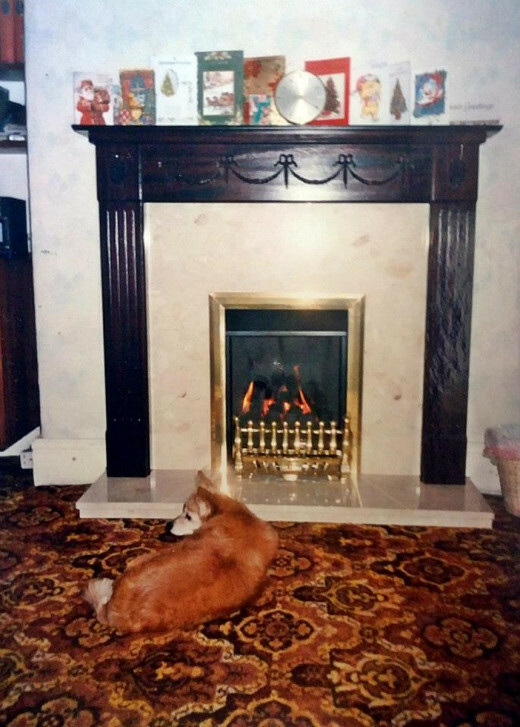 He always came home at Christmas and I remember one year, he bought mum and dad a new, modern gas fire and surround for their dining room. The house was quite old and used to have coal fires in every room, although only one remained when I was young - in the lounge for my grandma. My brother decided it was time to bring them into the 20th century and they were thrilled with their new gas fire! We were all thrilled with the new gas fire! 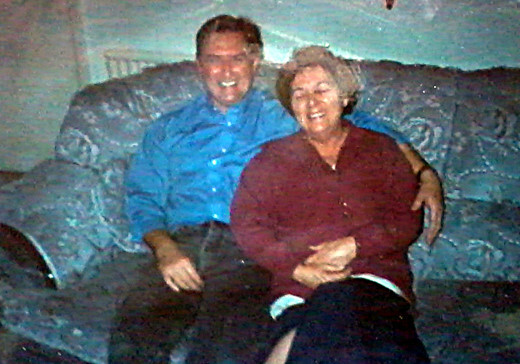 Eric with our mum in the 1990s. My brother met my sister-in-law, Liza, an IT expert, through one of his engineering contracts and they now have two beautiful daughters, who are both very bright and talented like their parents. I would like to say I followed in his footsteps and chiseled out a meaningful career for myself. But sadly, despite having the intelligence and the same opportunities as my brother, I let myself down with my attitude and spent at least five years in and out of meaningless jobs and periods of unemployment, because I preferred going out partying with my friends in my youth. I recall even when I was working in my first job as a reporter, my brother baled me out after I over-stretched my finances by buying a big saloon car on Hire Purchase. I fell behind with the payments and one day, he took me down to the bank and said he was paying it off for me in full. It is only years later, when we look back at our life and family, that we realise how much people have done for us and how much we appreciate their help in keeping our life on track. He has helped me so much over the years, I can never thank him enough and am indebted to him for helping me lead a better life. 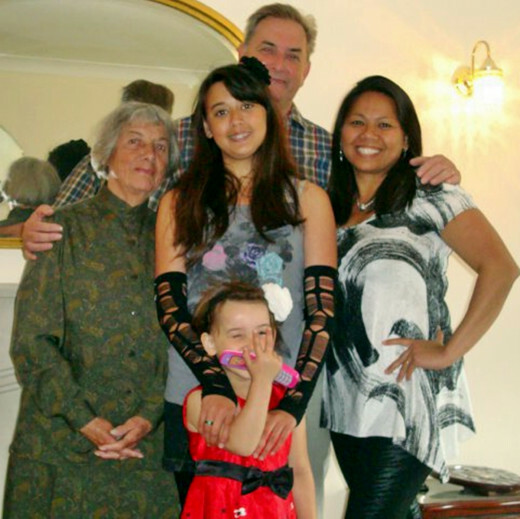 My brother with my sister-in-law Liza, my nieces Becky and Sarah and our mum. Of course, it is not only material things which help families, but emotional support too. 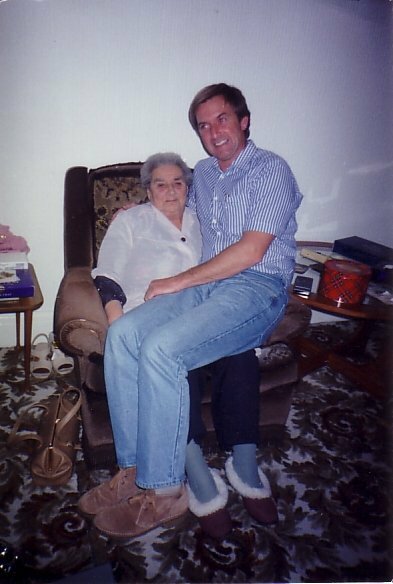 Following the death of our grandma in 1992 and then our dad's passing in 1999, my brother was there to help the heartbreaking occasions of organising their funerals and offering a shoulder to mum and me. Our dad died very suddenly and unexpectedly of a heart attack and my brother was abroad when it happened. 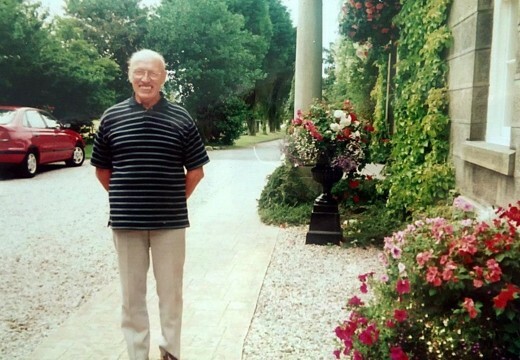 He caught the next flight back and at dad's funeral narrated a beautiful eulogy which was full of warmth and love. I was in pieces and unable to speak myself at the service, but my brother held it together and paid a lovely tribute to our dear dad, whom we still miss immensely to this day. Since dad's death, my brother has been a rock for our mum and for me, in addition to providing for his own wife and children. 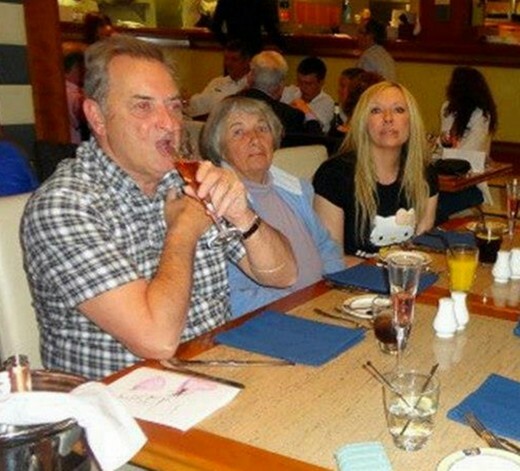 Nothing is too much trouble for him when it comes to family. My brother continues to work hard in the civil engineering industry and has managed many major global projects during his long career. 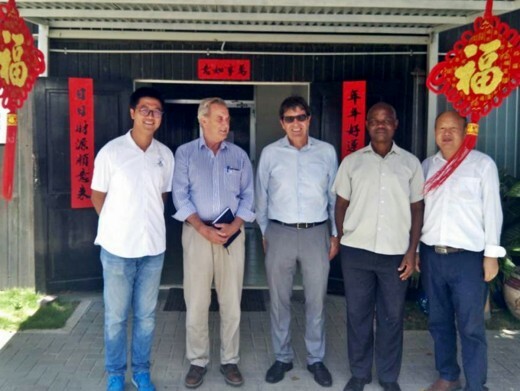 In recent years, he managed a project to construct new airport runways in the Maldives. His latest construction project is in Tanzania and he says he plans to retire when this is completed. He continues to be highly regarded in the sector and I'm extremely proud of him. My brother Eric (pictured second left) with work colleagues in February 2018 at his current civil engineering contract in Tanzania. Nothing can compare to the love and support of your family. I have come to realise this over the years. Having the support and guidance of a big brother has made me a better person and I hope anyone reading this Hub who agrees with the sentiments expressed will go and give their family a big hug. They can never be replaced and should be cherished for ever. Eric and me in around 2004. 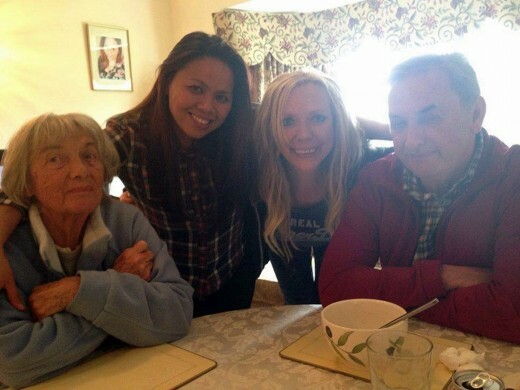 My brother with mum, me and my sister-in-law Liza in 2014. 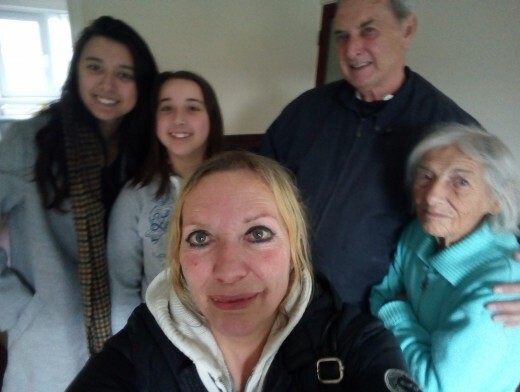 Me with my nieces Becky (far left) and Sarah, Eric and our mum, in January 2018. I loved reading your Hub. I was a teenager in the 70s and I looked at some of the fashions on here and it made me giggle and recall my own youth! I too have a big brother and don't know what I'd do without him. Thanks, George. Yes, the fashions were certainly appalling - I remember my schoolfriends and I going to a shop and trying to buy the jeans with the widest flares possible ... horrific! An interesting read. I too remember the 1970s well and have a certain nostalgia for the era - although the fashions left much to be desired! Thanks, Randall. My brother was pretty cool in his youth! I love the photo. And the clothes. Hi Nell. Thanks for your comment, I am pleased you like my Hub. I have such fond memories of the '70s. It was a wonderful era for me, living in a seaside resort and having such a great family and friends. A good read, thank you for sharing this story with us. So enjoyed this read; thanks for sharing and wishing you a great day.